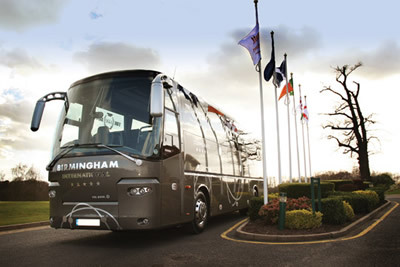 Birmingham International Coaches are an affordable coach travel company based in Birmingham, West Midlands. Birmingham International Coaches operate some of the finest coaches on the market. Fulfilling all types of private and contract Hire. Birmingham International Coaches meets the high standards for the Coach Marque status award, the UK coach industry’s only quality and safety standard accreditation scheme. Travelling on a Coach Marque vehicle means that you can be reassured of no less than a first-class service. We would be delighted to offer you the opportunity to utilise our private coach hire travel services with competitive fee structure and/or accept an invitation to quote for a specific contract private coach excursion.You will find we are Ideally located for; Birmingham International Airport, National Exhibition Centre, Birmingham City Centre. International Convention Centre and the National Indoor Arena. Birmingham International Coaches Ltd Private Hire Coach and Bus specialist prides itself on the ability to provide executive Coach and Bus travel at affordable prices.